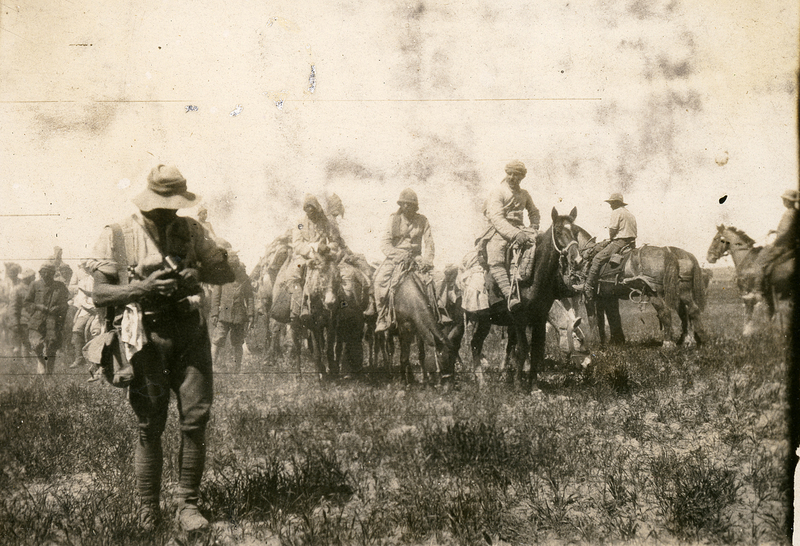 We had a glorious three-mile gallop in artillery formation each troop 200 yards apart. Shrapnel first, then machine guns; opened up on 5,000 men coming on Gaza in a long curve. This confused the Turkish gunners, they wasted a lot of ammunition, did everything but kill us. We dismounted behind a low-range of hills. Then went in on foot to attack the main ridge dominating Gaza town. Their delay was caused in part by a dense fog, which had stymied the British infantry’s main assault on the south of the town that morning. Despite having almost seized the town by evening, the Allies were ordered to withdraw for another good ‘military reason’ – elements of three Ottoman divisions were marching to reinforce the Gaza garrison, threatening to leave the New Zealanders and other mounted riflemen isolated without sufficient water, food, ammunition and defences. 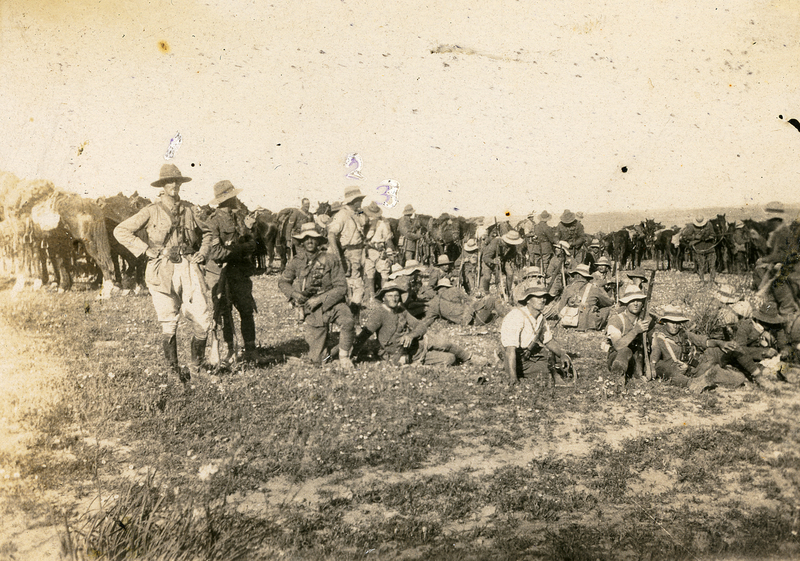 Mustering for 1st attack on Gaza, 26 March 1917. Image courtesy of Auckland War Memorial Museum, PH-ALB-213. The British invasion of Ottoman-held Palestine in 1917–18 was the third campaign launched by the British against the Ottoman Turks in the Middle East in the First World War. Having defeated Ottoman forces in the Sinai Desert campaign, the Egyptian Expeditionary Force – which included the New Zealand Mounted Rifles Brigade – launched an attack on Gaza, the gateway to Palestine, on 26 March 1917 in what became known as the First Battle of Gaza. Under the cover of darkness that morning, the mounted riflemen had set off from their positions south of Gaza, and trekked through the desert to surround the coastal town. 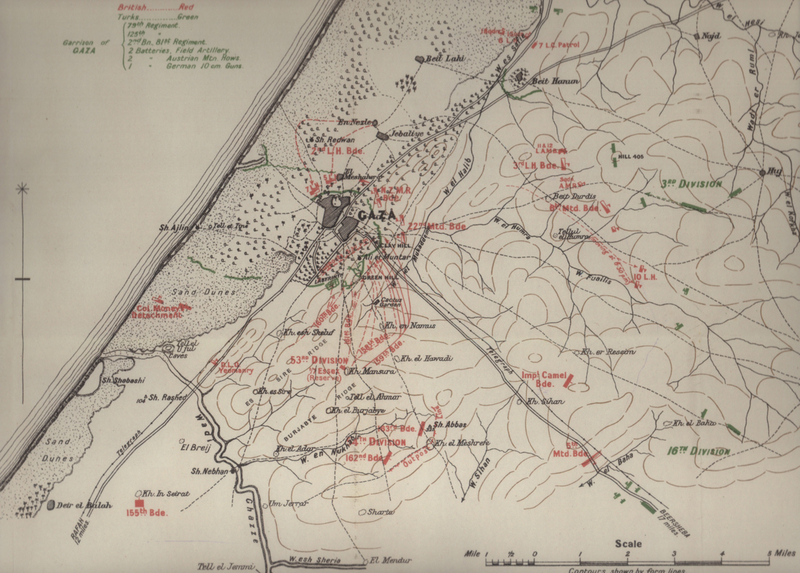 Their aim was to cut supply lines to Gaza and prevent a retreat of the town’s Ottoman garrison, who were due to face a frontal infantry and artillery assault from the south. Positions at 6.30 pm on 26 March 1917, with the NZ Mounted Rifle Brigade on the north-east outskirt of the town. [I]n due course I met another hedge. I spied a hole in the bottom of it, crawled through it, and found myself in Gaza’s cemetery. Before I had time to find my way out of it, I was fired upon by a sniper. Having survived the latter half of Gallipoli I know all about snipers, and forthwith smartly dived for cover alongside the nearest Muslim gravestone. Muslim gravestones unlike ours are long like a coffin and about 18 inches high. This sniper was obviously angry because he had missed me when I was standing up…. So he methodically shot pieces out of my cover defence. I dared not raise my head to locate him! …. He was up in an olive tree, his skin was the same drab green. For his third shot at me he climbed up another branch and shot me through the right lung over the top of the gravestone. It was curtains for me for some time – unknown to me. How long Trooper Barry lay wounded in the cemetery at Gaza is not known. At 6.45 pm, with darkness falling, the order was given to evacuate. Although the town was almost in the Allies’ grasp, there was insufficient time to consolidate their gains before an expected counter-attack from the Ottoman reinforcements. Feeling that their senior generals had just snatched defeat from the jaws of victory, the bewildered British, New Zealand and Australian troops withdrew from Gaza and returned to their base on the Sinai Peninsula. The Turkish General of the 53rd Division was captured during the battle. He appears in the centre of this photo with Generals Chaytor, Urquhart, Chauvel, Colonel Brown and Major Synnot. Image courtesy of Auckland War Memorial Museum, PH-ALB-213. A second frontal attack on Gaza was made several weeks later, but this – the Second Battle of Gaza – also failed. It was not until the Third Battle of Gaza, when the Anzac mounted troops took Beersheba, that the Egyptian Expeditionary Force was successful in their invasion of Palestine. Trooper Barry survived the sniper’s bullet, but his road to recovery was long. From Gaza he was transported either by wagon or on the back of a camel or horse to an advanced dressing station on the Sinai Peninsula. From there he was transferred to a series of hospitals in Egypt over the following months. In June 1917, a doctor at the Aotea Convalescent Home in Heliopolis suggested that Barry would ‘benefit by change to NZ.’ He was eventually discharged from Wellington Hospital, and the New Zealand Expeditionary Force, in December 1917. Some of the Turkish General's staff, captured at Gaza 26 March 1917. Image courtesy of Auckland War Memorial Museum, PH ALB-213.